The Bhagavathy Amman Temple in Kodungallur was established by Cheran Senguttuvan, a Chera King. The Temple is known for its Bharani Festivals and the Thalappoli Festivals. Devotees offer Pepper and Turmeric to the deity to get their wishes fulfilled. The temple is dedicated to BhadraKali, an incarnation of Goddess Parvati. The Idol of Goddess is inimitable with eight hands with various traits. There are many myths and legends related to this temple. One says that Cheran Senguttuvan built this temple to honor the martyr Kannagi, a mythical Tamil woman, who destroyed the entire Madurai city by a curse, for her husband was killed by mistake during Pandyas Kingdom. Also few say that Lord Parasuram built this temple in order to protect Kerala from an Asura, Daruka. In sanctum sanctorum one could see five chakras installed by Adi Guru Shankaracharya. 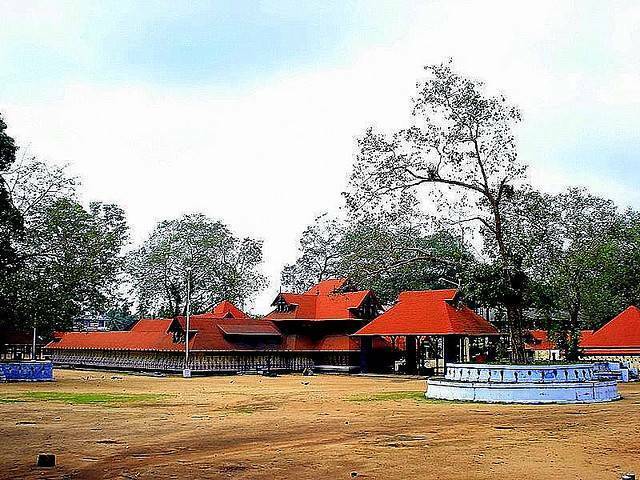 The Kodungallur Bhagavathy Temple is surrounded by Peepal and Banyan Trees and spread over ten acre land. The main idol of Bhagavathy is carved out of Jackfruit tree with a height of seven feet. Towards left of the main shrine, lies a shrine with a deity usually called as “Samadhi of Vysoori”, which is interestingly worshipped to cure small pox, chicken pox and mumps. Devotees take a bath in “Pushkarini” (sacred pond) which is situated some 50 meters away. The “Bharani festival” is celebrated from Mid-March till Mid-April. Similarly, the Thalappoli Festival is celebrated from Mid-January till Mid- April.